Inappropriate activation of the renin-angiotensin system (RAS) exacerbates renal and vascular injury. Accordingly, treatment with global RAS antagonists attenuates cardiovascular risk and slows the progression of proteinuric kidney disease. By reducing BP, RAS inhibitors limit secondary immune activation responding to hemodynamic injury in the target organ. However, RAS activation in hematopoietic cells has immunologic effects that diverge from those of RAS stimulation in the kidney and vasculature. In preclinical studies, activating type 1 angiotensin (AT1) receptors in T lymphocytes and myeloid cells blunts the polarization of these cells toward proinflammatory phenotypes, protecting the kidney from hypertensive injury and fibrosis. These endogenous functions of immune AT1 receptors temper the pathogenic actions of renal and vascular AT1 receptors during hypertension. By counteracting the effects of AT1 receptor stimulation in the target organ, exogenous administration of AT2 receptor agonists or angiotensin 1–7 analogs may similarly limit inflammatory injury to the heart and kidney. Moreover, although angiotensin II is the classic effector molecule of the RAS, several RAS enzymes affect immune homeostasis independently of canonic angiotensin II generation. Thus, as reviewed here, multiple components of the RAS signaling cascade influence inflammatory cell phenotype and function with unpredictable and context-specific effects on innate and adaptive immunity. The renin-angiotensin system (RAS) is a critical hormonal signaling cascade engaged in body fluid and BP homeostasis (Figure 1). Reductions in kidney perfusion stimulate the RAS with consequent renal sodium retention and intravascular volume expansion.1–3 Inappropriate activation of the RAS therefore leads to hypertension and progression of kidney and cardiovascular disease. Accordingly, medicines that block the actions of the RAS are among the most effective classes of agents used to reduce BP and ameliorate diabetic and nondiabetic kidney disease.4–7 Although the classically recognized functions of the RAS to promote renal sodium retention and vasoconstriction are mediated through the binding of angiotensin II (Ang II) to type 1 angiotensin (AT1) receptors,8,9 other peptides, enzymes, and receptors in this cascade have received increased scrutiny for their independent contributions to developmental biology, renal and vascular function, and immunity. The discovery that the production of RAS components in kidney parenchymal cells is regulated independently of RAS peptide levels in the circulation introduced a paradigm shift in our understanding of how the RAS contributes to the pathogenesis of hypertension.10 Tissue-specific regulation and functions of the RAS are similarly evident in other organs including those engaged in innate and adaptive immune responses. Indeed, cell lineages that constitute the immune system have the capacity to express RAS components,11,12 and the effects of the RAS peptides and enzymes on inflammatory responses are quite diverse. However, one recurring theme that emerges from the work of several laboratories including our own is that activating AT1 receptors directly on hematopoietic cells may provide a feedback, immunosuppressive signal to temper or limit the pathogenic actions of inappropriate RAS activation in the kidney, vasculature, and nervous system. Below, we highlight several of the immunologic effects of the RAS. The renin angiotensin system. The RAS is composed of multiple substrates and enzymes that can act in concert or separately to exert physiologic actions. The most well described function of the RAS is regulation of BP homeostasis. Angiotensinogen is converted to Ang I by renin in the circulation. Ang I is subsequently cleaved by ACE to produce Ang II, an effector molecule that increases vascular tone and promotes sodium reabsorption in the kidney by ligating the AT1 receptor. Apart from these canonic functions, several components of the RAS modulate immune responses. (Pro)renin and ACE regulate hematopoietic cell differentiation. AT1 receptor activation in immune cells versus the kidney exerts divergent effects on tissue inflammation. By degrading Ang II and/or by catalyzing the generation of Ang 1–7, ACE2 ameliorates inflammatory injury in the kidney and vasculature. Preclinical and clinical studies using AT1 receptor blockers (ARBs) and angiotensin converting enzyme inhibitors (ACEIs) have indicated that global RAS activation can drive inflammation in the kidney and vasculature through BP-independent mechanisms. For example, quinapril therapy reduces renal glomerular and tubular injury and inflammatory cell accumulation in rodent models of immune-complex GN,13–15 whereas ACEI or ARB treatment ameliorates murine lupus nephritis to a greater extent than amlodipine.16 In atherosclerosis, angiotensin converting enzyme (ACE) inhibition attenuates the vascular expression of the mononuclear cell chemokine CCL2 and the intralesional accumulation of inflammatory macrophages.17 Moreover, RAS-mediated induction of the profibrotic cytokine TGF-β has been recognized as a fundamental driver of scar formation in the kidney and, more recently, autoimmune inflammation in the brain.18–20 In human patients with CKD, RAS inhibition limits renal inflammation and oxidative stress independently of BP.21 These types of experiments developed the thesis that global RAS activation instigates tissue damage in part by stimulating cellular immune responses. Indeed, experiments using mice with genetic deletion of the dominant murine AT1 isoform, AT1A, have largely confirmed that the proinflammatory effects of RAS activation accrue from stimulating AT1 receptors in the target organ. For example, after bone marrow transfer between Agtr1a−/− mice lacking the AT1A receptor and wild-type controls, susceptibility to immune-mediated kidney injury and renal macrophage accumulation arose from AT1A receptor expression in the host rather than the bone marrow donor.31,32 In our own hands, AT1A receptor expression on bone marrow cells did not influence the progression of murine lupus nephritis. Rather, augmented AT1 receptor activation in the glomerular podocyte triggered robust renal inflammation in this model.33 Likewise, inflammation in the atherosclerotic lesion depended on AT1 receptor activation in the blood vessel rather than the bone marrow.34,35 Thus, the effects of the RAS to promote inflammation appeared to accrue from activation of AT1 receptors in the kidney and vasculature rather than in infiltrating hematopoietic cells. However, these studies belied a more complex set of interactions between the immune system and individual RAS components that became evident through gene deletion experiments discussed below. In converting angiotensinogen to angiotensin I (Ang I), renin catalyzes the rate-limiting step in the generation of the RAS effector molecule, Ang II (Figure 1). Accordingly, renin is the proximate driver of AT1 receptor-dependent inflammation in the vascular wall.34,36 However, in 2002, Nguyen and colleagues cloned the (pro)renin receptor (PRR) through which renin and its precursor (pro)renin activate the extracellular signal-regulated kinase 1/2 signaling cascade independently of canonic Ang II generation.37 Whereas the PRR is part of a Wnt/β-catenin signaling complex that is critical for planar development,38 the PRR is also broadly expressed in cardiovascular control organs where its ligation can directly promote inflammation. For example, PRR stimulation enhances proinflammatory cytokine levels in the vasculature and microglia.39,40 Within the immune system, the PRR pathway is active in human monocytes and is required in T lymphocytes for their acquisition of peripheral T cell markers including CD4 and CD8 during thymic education.41,42 Moreover, the PRR is expressed on both macrophages and T cells infiltrating the glomerulus during human crescentic GN, and renin-mediated induction of IL-6 and cyclooxygenase-2 in human mononuclear cells requires extracellular signal-regulated kinase 1/2 phosphorylation but not angiotensin receptor ligation.43 These data support a new paradigm in which RAS components other than the effector molecule Ang II modulate inflammation in the target organ. However, the net effects of renin’s classic proteolytic actions combined with its nonproteolytic signaling via the PRR in inflammatory disease await further clarification. As the dominant enzyme that converts Ang I to the RAS effector molecule Ang II, ACE promotes inflammation in the heart, kidney, and vasculature that is attributable to Ang II (Figure 1). Accordingly, ACE inhibition not only ameliorates cardiac damage after myocardial infarction and slows the progression of proteinuric kidney disease, but also reduces circulating and urinary levels of inflammatory markers.5,44–48 Early studies investigating the immune functions of ACE focused on the role of ACE in granulomatous disease. Secreted by histiocytes in granulomata, circulating ACE became a marker to support the diagnosis of sarcoidosis.49 In turn, ACE inhibition could shrink the granulomata induced by Schistosoma mansoni infection, suggesting that ACE similarly contributes to the infectious inflammatory response.50 Nevertheless, ACE, like (pro)renin, has other pleiotropic effects on immunity that have emerged more recently. First, separate from its functions as a proteolytic enzyme, ACE acts as a transcription factor to direct the emergence of endothelial, myeloid, erythroid, and lymphoid cell lineages from hemangioblast colonies.51 This biology may contribute to the development of anemia in some ACEI-treated patients although alterations in erythropoietin levels also play a role.52 Second, ACE edits the carboxyl terminus of peptide antigens presented to CD8+ T cells in the context of class I major histocompatibility molecules.53 This function of ACE would have unpredictable effects on adaptive immune responses, depending on specific alterations in antigen sequences mediated through ACE’s carboxypeptidase activity (Figure 2). Thus, whereas ACE-mediated generation of Ang II in the target organ triggers damage to invoke a secondary inflammatory response, the direct actions of ACE within immune cells and their progenitors are more nuanced and context-specific. ACE-mediated cleavage of MHC I peptides in antigen presenting cells modulates adaptive immunity. Cytoplasmic proteins or exogenous antigens (in the case of dendritic cell cross presentation) are fragmented by proteasomes. Peptide products are then shuttled to the endoplasmic reticulum (ER) where ACE can alter the peptide sequence via C-terminal cleavage. After MHC I loading, the peptide is transported to the cell surface. CD8+ T cells scan the MHC I complex and, upon recognition, initiate an adaptive immune response. Alterations made by ACE to the peptide sequence can thereby alter the specificity of the immune response. Although the notion that ACE2 blunts inflammatory responses by raising levels of Ang 1–7 is still debated, treatment with Ang 1–7 has successfully reduced inflammatory damage in the heart and kidney in several preclinical studies. For example, Ang 1–7 infusion limits inflammatory cardiac injury in a diabetic hypertensive rat model56 and attenuates glomerular injury and renal expression of inflammatory markers in a rat MPGN model.57 Whether the benefits of Ang 1–7 accrue from activation of the putative Ang 1–7, or Mas, receptor is less clear as Ang 1–7 formulations can mitigate tissue inflammation even in Mas-deficient rodents.58 Moreover, the favorable actions of Ang 1–7 are not universally seen in all forms of renal damage as experimental kidney fibrosis and AKI worsen with Ang 1–7 treatment.59 Thus, the immunologic effects of Ang 1–7 may depend not only on its dose and formulation but also on disease context, and careful translational studies will be required to determine if Ang 1–7 represents a novel anti-inflammatory therapeutic to ameliorate specific renal and vascular diseases. In the adult organism, the AT1 receptor is more highly expressed in cells of the immune system than the type 2 angiotensin receptor (AT2) receptor.11,60,61 Given the capacity of global RAS activation to drive renal and vascular inflammation during hypertension, several groups have examined the role of AT1 receptors on immune cells in regulating hypertensive target organ damage through the generation of murine Agtr1a−/− bone marrow chimeras. The Tsukuba mouse harbors the human renin and angiotensinogen genes and therefore serves as a model of hypertension induced by chronic RAS stimulation. Tsukuba mouse chimeras lacking the AT1A receptor on bone marrow–derived cells have a preserved hypertensive response but more severe atherosclerosis in the aorta compared with wild-type transplant controls.62 Similarly, in a chronic Ang II infusion model of hypertension, we found that AT1A receptor–deficient bone marrow chimeras have exaggerated BP elevation, albuminuria, and accumulation of T cells and macrophages in the kidney.60 Thus, in contrast to the pathogenic actions of renal and vascular AT1 receptors in hypertension, AT1 receptors on immune cells appear to play a protective role (Figure 3). Functions of the AT1 receptor on immune cells. Proinflammatory stimuli drive the differentiation of M1 macrophages (left) and Th1 T lymphocytes (right) that release pathogenic cytokines such as IL-1β, TNF, and IFN-γ (IFNG). In preclinical studies, activation of the AT1 receptor on macrophages and T cells limits their differentiation toward proinflammatory lineages, thus inhibiting the production and release of these cytokines that drive hypertensive kidney injury and fibrosis. In our chronic Ang II infusion model, the Macro KO animals lacking myeloid AT1A receptors also had a preserved hypertensive response.63 On the basis of these data, AT1 receptors on T cells and macrophages do not play a key role in BP homeostasis. Nevertheless, the Macro KO cohort had more severe renal tubular injury and interstitial fibrosis than controls after 4 weeks of hypertension. This capacity of the macrophage AT1 receptor to mitigate kidney fibrosis was similarly evident in the normotensive ureteral obstruction model,63 consistent with Ichikawa’s experiments using AT1A receptor–deficient bone marrow chimeras.66 Analogous to the effects of the AT1 receptor on T cell polarization, we found that activating the AT1 receptor on macrophages suppresses their proinflammatory M1 polarization with consequent reductions in TNF and IL-1β expression. In a murine obesity model, Ma and Fogo similarly detected enhanced expression of several M1 markers on AT1A receptor–deficient macrophages.67 M1 cytokines have been implicated in renal fibrogenesis, and in kidney crosstransplant studies we were able to confirm that the macrophage AT1 receptor ameliorates kidney fibrosis by limiting IL-1 generation and thereby abrogating IL-1 receptor stimulation in renal parenchymal cells.63 Thus, on the basis of bone marrow chimera and conditional gene targeting studies, AT1 receptors on myeloid and lymphoid populations play an immunomodulatory role that tempers the pathogenic actions of AT1 receptors in the kidney and vasculature during hypertension. However, considerable work will be required to elucidate cellular signaling pathways governing these effects and develop translational approaches that exploit divergent, cell-specific actions of AT1 receptors in patients with hypertension and/or kidney fibrosis. Actions of the AT2 receptor counteract the actions of the AT1 receptor in several organ systems.68 For example, in contrast to AT1 receptor–mediated vasoconstriction, AT2 receptor activation in the vasculature prompts vasodilation with potential beneficial effects in the renal microcirculation during pathogenic conditions.69 In our hands and others, the AT2 receptor is not highly expressed on cells of the immune system,61,63,64 but has been detected on human T and NK cells.12 In a rat model of myocardial infarction, intracardiac transfer of CD4+ or CD8+ T cell populations expressing the AT2 receptor reduced infarct size and improved cardiac function.70,71 The protective effects of AT2 receptor activation in the target organ can also have downstream beneficial effects on the tissue’s inflammatory milieu. The development of a selective AT2 receptor agonist, compound 21 (C21),72 has highlighted the potential broad anti-inflammatory effects of AT2 receptor stimulation. For example, in a rat myocardial infarction model, AT2 receptor stimulation with C21 reduced scar size, preserved ejection fraction, and prevented upregulation of the proinflammatory cytokines IL-1β and IL-6 in the border zone of the infarcts, all of which was reversed by concomitant treatment with the AT2 receptor blocker PD 123319.73 AT2 receptor activation similarly reduced renal inflammation measured by TNF and IL-6 expression and oxidative stress in the Zucker rat model of renal injury.74 Moreover, treatment of cultured proximal tubule epithelial cells with C21 reduced TNF and IL-6 production in response to LPS activation.75 The immunosuppressive effects of AT2 receptor stimulation accrue from enhanced epoxyeicosatrienoic acid formation and direct inhibition of the NF-κB inflammatory signaling cascade.76 These preclinical studies indicate that the immunomodulatory actions of the AT2 receptor occur both within infiltrating immune cells and within the target organ’s parenchymal cells. The discrepant and partially independent effects of the various RAS peptides and enzymes on immune responses should allow discrete, optimized interventions to limit RAS-dependent inflammation in humans. AT2 receptor and Ang 1–7 agonists, if carefully engineered and tested in specific cardiovascular and renal disease contexts, may complement current ACEI and ARB treatment, possibly by mitigating the induction of inflammatory responses that can result from blocking AT1 receptors on immune cells. Inasmuch as noncanonic renin/prorenin signaling provokes inflammatory responses independently of Ang II, direct renin inhibition may similarly complement standard RAS blockade by suppressing immunity. In this regard, human studies confirm the favorable effects of direct renin inhibition on parameters of immune activation. For example, in 27 patients with type 1 diabetes mellitus and no nephropathy, treatment with aliskerin for 30 days reduced urinary excretion of IFN-α2 and IL-2.77 Similarly, in 30 patients with hypertension and CKD, aliskerin treatment for 8 weeks reduced serum C reactive protein (CRP) levels.78 Nevertheless, the addition of direct renin inhibitors to ARB therapy has not yielded consistent improvements in clinical outcomes,79 diminishing enthusiasm for this strategy unless alternative, more efficacious modulators of noncanonic PRR signaling can be developed. In the absence of tools to modulate the RAS selectively within human immune cell lineages, studies in which patients are treated with ACEIs or ARBs reveal the net effect of concomitantly disrupting AT1 receptor signals in both the target organ and the immune system. In most cases, ACEI or ARB monotherapy in patients with hypertension has had favorable effects on circulating markers of inflammation. For example, in a randomized crossover trial in 45 patients with mild-to-moderate hypertension, candesartan reduced plasma levels of CCL2 and TNF after 2 months.83 Similarly, in 20 young, newly diagnosed patients with hypertension, 3 months of therapy with losartan normalized BP and reduced the proliferative responses of T lymphocytes drawn from the circulation.84 Finally, in a randomized, crossover trial of 47 hypertensive patients with hypercholesterolemia, the addition of losartan to simvastatin for 2 months reduced CCL2 levels more than simvastatin alone.85 However, in these types of studies, global RAS blockade in all tissues could obscure opposing tissue-specific immunologic effects, and indirect reductions in systemic inflammation during global RAS blockade could accrue from the hemodynamic protection of target organs. Consistent with these hemodynamic benefits, ACEI or ARB treatment for diseases localized to the blood vessel wall has largely attenuated circulating markers of inflammation. For example, in an uncontrolled study of 77 patients with known coronary artery disease, 6 months of ramipril reduced circulating CRP levels.86 Similarly, in 27 postangioplasty patients, irbesartan reduced IL-6 and CRP concentrations after 3 months compared with baseline.45 However, not all studies indicate that RAS inhibition reduces vascular inflammation through effects on BP. In an observational study of 507 patients with stroke, ramipril treatment was associated with lower CRP levels at the time of the stroke compared with other antihypertensive regimens.87 Regardless of the mechanism, disrupting pathologic vascular remodeling with RAS blockade has, on balance, improved parameters of systemic inflammation. By contrast, in patients with hypertension and renal inflammation, global RAS blockade has had mixed effects on immune responses. In 29 patients with hypertension and chronic GN, irbesartan therapy for 26 weeks yielded variable effects on immune parameters with reductions in circulating CRP levels but no significant effects on TNF or IL-6 levels.88Moreover, in a 16-week randomized study of 109 hypertensive diabetic patients, high-dose valsartan did not reduce serum IL-6 or TNF levels.89 Patients undergoing hemodialysis exhibit evidence of systemic inflammation, and in a randomized study of 15 hemodialysis patients,90 ramipril raised circulating IL-1β concentrations, consistent with our murine studies,63 but lowered IL-10 and IL-6 concentrations. Both ramipril and valsartan increased systemic oxidant stress measured by F(2)-isoprostane levels without modulating BP during dialysis. Thus, it is possible that in the context of renal inflammation, preserving a putative protective action of immune AT1 receptors while blocking AT1 receptors in cardiovascular control centers may become more relevant. Conversely, as inflammatory cells have lower levels of AT1 receptor expression than the kidney,64 vigorous levels of RAS activation may be required to invoke the protective actions of AT1 receptors on immune cells that partially abate the pathogenic actions of AT1 receptors in the kidney and vasculature. Gene polymorphism studies from patients with autoimmune disease are consistent with protective actions of the RAS in immune cells. In several series of human patients with SLE, lower serum ACE levels as a proxy for diminished systemic RAS activation have been associated with more severe renal disease.91,92 Similarly, lower serum ACE levels in patients with pulmonary sarcoidosis associated with a more vigorous immunogenic response to influenza vaccination.93 However, not all human cohorts confirm this inverse association,94,95 and such observational gene association studies must be interpreted with caution. An intriguing example of apparent immune amplification during RAS blockade has been reported in patients with an idiosyncratic ARB-associated inflammatory bowel disease, a disorder classically driven by hyperactive Th1 immune responses. In these rare cases, treatment with the ARB olmesartan has been linked to a severe immune-mediated enteropathy.96–98 Consistent with a heightened Th1 response in this syndrome, intraepithelial CD3+ T cell accumulations are noted in the bowel wall, and disease responds to anti-TNF therapy. These clinical features are consistent with our finding that mice lacking the AT1 receptor on T lymphocytes have an exaggerated Th1 response with an augmented capacity for TNF generation.64 The enteropathy occurs more commonly in patients with other evidence of autoimmunity, suggesting a predisposition to ARB-induced immune activation. Randomized controlled trials of RAS inhibition provide some indications that preserving a low level of RAS signaling may be protective. In the ONTARGET and NEPHRON-D studies, complete RAS blockade with concomitant ACEI and ARB treatment led to higher levels of kidney dysfunction than ACEI or ARB monotherapy, despite no difference in systolic BPs between ARB treatment and dual blockade.99,100 In a smaller double-blinded randomized study of 56 patients with macroalbuminuric diabetic nephropathy, combination therapy increased the adjusted risk for worsening proteinuria and increased urinary excretion of CCL2 compared with ACEI or ARB monotherapy.101 These trials would indicate that a threshold level of RAS inhibition rather than maximal, dual blockade is optimal for the treatment of hypertension and kidney disease. If permitting RAS activation in immune cells is beneficial, then blocking RAS signals selectively within the end organ, such as the heart or kidney, could ameliorate disease in these organs more effectively than global, systemic RAS blockade. Some human biopsy studies support the notion that RAS blockade reduces inflammation by acting directly within the target organ. For example, analysis of heart biopsy specimens from 58 patients with ischemic heart disease randomized to ramipril, valsartan, or placebo for 6 days before coronary bypass surgery showed that treatment with either the ACEI or the ARB was associated with lower TNF and IL-6 levels in the cardiac tissue.102 RAS inhibitors with inherent specificity for target organs could offer one strategy to combat local inflammation while preserving any beneficial RAS signals in circulating hematopoietic cells. For example, in a small study of patients who had suffered myocardial infarctions, treatment with “high–tissue penetrating” quinapril reduced circulating CRP levels more than “low–tissue penetrating” enalapril.103 Although authors attributed the differences in efficacy to enhanced vascular wall penetration with quinapril, differences in potency would offer an alternative explanation. Complementing its central role in BP homeostasis, the RAS has diverse and complex effects on innate and adaptive immunity. Through coordinated regulation of Ang II levels, the RAS proteolytic cascade affects hemodynamic injury in the heart, kidney, and vasculature leading to profound, global upregulation of inflammatory responses. However, through actions unrelated to Ang II, the (pro)renin receptor and ACE affect the development and differentiation of individual immune cell lineages, the consequences of which will require further elucidation. 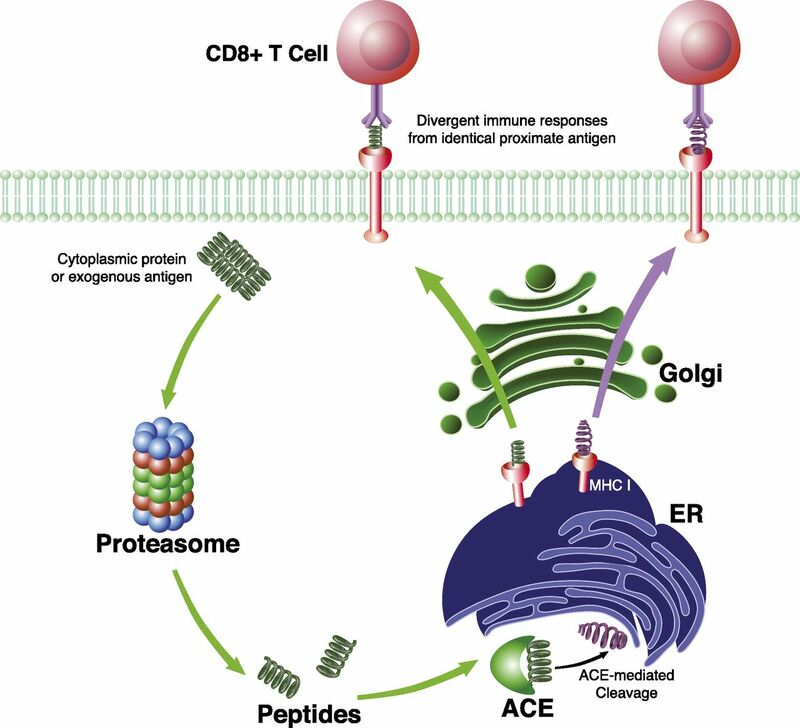 Moreover, by altering the peptide sequences of antigens presented to CD8+ T cells, ACE may have profound effects on antiviral immunity and even tumor surveillance. Although activating AT1 receptors in the kidney and vasculature instigates damage that secondarily engages the immune system, bone marrow chimera and conditional gene targeting studies in mice indicate that stimulating AT1 receptors directly on inflammatory cells paradoxically tempers this immune activation in an apparent feedback paradigm. This phenomenon cannot be easily ascribed to AT1 receptor–mediated immune cell “exhaustion” as we do not detect markers of exhaustion on T lymphocytes subjected to chronic RAS activation.64 Moreover, we see divergent, pathogenic, and protective actions of renal and T cell AT1 receptors, respectively, in a single murine model of AKI well before T cell exhaustion should emerge.110 Confirmation that AT1 receptor activation on immune cells suppresses the inflammation and injury induced by activation of AT1 receptors in the kidney and vasculature would open new avenues for novel immunomodulatory therapies to be used in conjunction with global ARBs. Indeed, TNF and IL-1, both regulated by the immune AT1 receptor in our experiments, have been linked to hypertension and/or vascular dysfunction in preclinical and clinical studies.25,65,106,111,112 Other potential anti-inflammatory RAS therapies that warrant further translational investigation include Ang 1–7 analogs and specific AT2 receptor agonists.113 Finally, because of space constraints, this review has not addressed important immunologic effects of the RAS effector aldosterone.114 Because the RAS signaling cascade interacts at multiple levels with the immune system, developing incisive and cell lineage–specific “cocktails” for RAS-dependent immune modulation should lead to improved protection of the kidney and vasculature through BP-dependent and -independent mechanisms. This work was supported by National Institutes of Health grants DK087893, HL128355, and P30DK096493; Veterans Health Administration, Office of Research and Development, Biomedical Laboratory Research and Development Grant BX000893; and the Edna and Fred L. Mandel Center for Hypertension and Atherosclerosis Research.